Today I got some Hake which just came off the boat. What boat? I'm not sure. My fish guy just says they come off of boats. I'm not much of an outdoorsman. I just assume that hake are a species of super-advanced fish which have mastered sea travel aboard boats and wear masks filled with water so that they can breath on land. So, in my mind, hake are kind of like Krang the Conqueror. I think most marine biologists would be shocked to see how accurate my estimate of hake is. And to think, I didn't even have to spend $160,000 to go to marine biology school or wherever it is that you learn about fish and oceans and stuff. I should change my last name to be more reflective of my skills and knowledge. From now on I will be Nathan Bridger. I seasoned up the hake with some chili, cumin, lime, tequila, cilantro, and cayenne, then seared it in a pan and roasted it until just done. 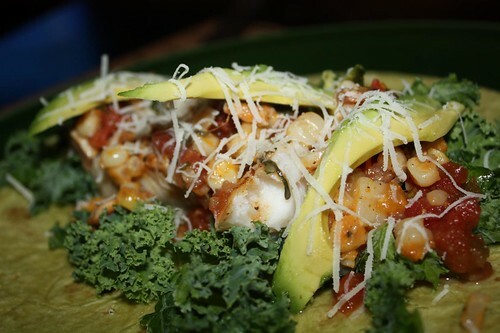 I served it up on a tortilla with kale, the remaining corn from our scallops the other night, some avocado, salsa, cilantro, and manchego cheese. Every time I combine tequila and lime (outside of a margarita) I feel a little guilty. Mostly because it seems like something that should be on an Applebee's menu specialty created by a celebrity chef like Tyler Florence or Guy Fieri. To think, if this blog gets about six or seven million more followers I may be able to have my own Applebee's menu items coming soon! Be on the look out for Nathan Bridger's Ultimate Chili Cheese Jalapeno Tequila Piquillo Pepper Popper Sliders! MMM, I'll two of those Sliders!! Too bad I can't seem to edit my previous post (add the word take or have). Guess I'll just have to order another. Tequila shots go great with those sliders! Coho Ho and a Bottle of . . . Radishes?